Ok, let’s take a look what we have technicaly now!? In front of the buyers there is resistance level which starts at 1.1150 > 1.1190/200 is the stronger one and that’s not the end of the sellers area. 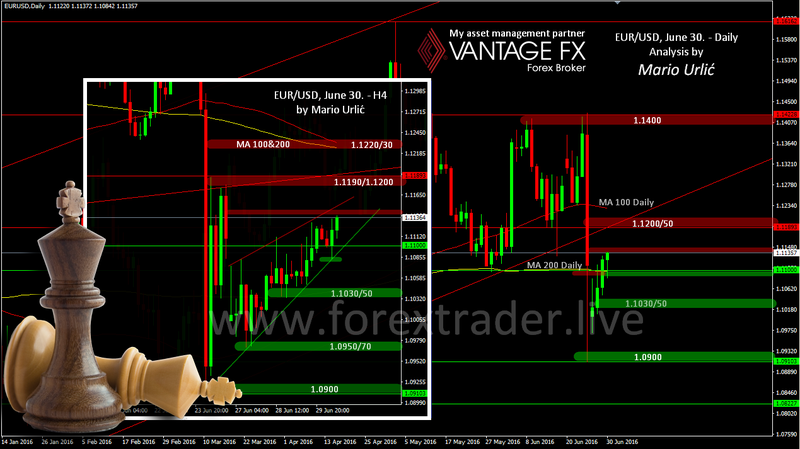 There is also a several important MA’s at the level 1.1230 and they are just above the strong trend lines. That’s why it will be important to see how the pair will move there if the buyers reach that. You can see how the buyers build supports levels and climbed up with help of this trend line. That’s why on the way back, the first stronger support is 1.1090/1.1100 now, the daily MA200 and that could hold the sellers if they took over the pair. It’s not so volatile here, but it’s very interesting for us analysts. This is now the chess game and every move is important.